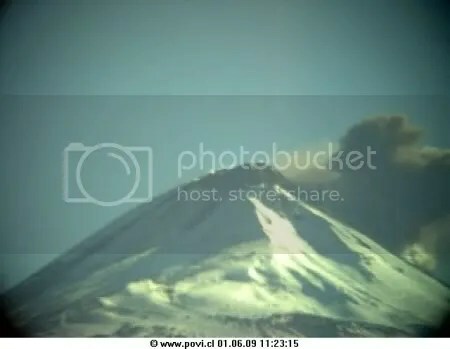 The last summit eruption, as part of the current cycle started in may 2007, lasted 72 hour starting from April 4. The 3 block lava flows reached a total length of 12,5 km. On April 24 and June 1st sporadic phreatic emission and red glow was observed from a 300 m long lateral active fissure on the eastern upper flank. Until mid July a weak red glow was observed on the western crater rim. The 350 m wide inner crater remains filled with pyroclasts and lava emitted during the long lasting current eruption cycle. 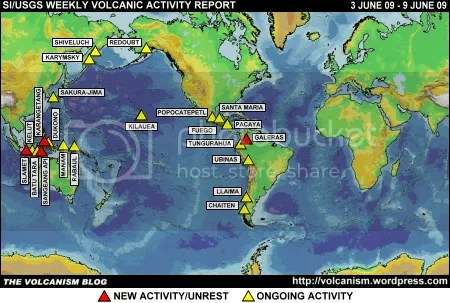 The following graphic shows the time table (chronology) of the current eruption cycle. Half column means weak to moderate ash eruption and/or lava flow (VEI 1). Long column means moderate to strong explosive strombolian eruption (VEI 2 -3). Thanks, as ever, to all the team at POVI for keeping us up-to-date with developments at Llaima. For our report of the latest SERNAGEOMIN bulletin on Llaima, click here. The Chilean state geological service SERNAGEOMIN has published brief updates on Chaitén and Llaima volcanoes on its website in a combined bulletin dated 31 August 2009. Translation as follows. 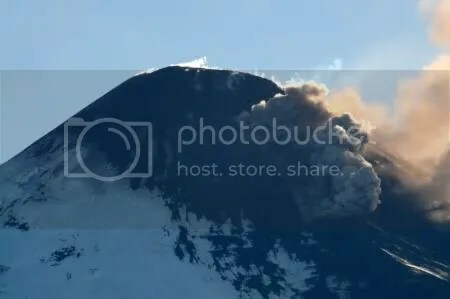 In the period between 4 and 20 August the eruptive activity of Chaitén has continued with the growth of the dome complex – particularly towards the western sector of the caldera – observable only occasionally because of the winter season. The column of gases, composed of water vapour and ash, has occasionally risen to 1.5 km above the complex. Moreover, the quantity of pyroclastic material from fallen volcanic rock originating from both block-and-ash flows and lateral explosions has formed important accumulations in the adjacent valleys and especially towards the valley of the Chaitén river, from which the fresh occurrence of lahars towards Chaitén during torrential rains cannot be ruled out. In consequence, given that the seismic activity remains elevated as a result of the growth of the dome complex, with the possibility of the generation of block-and-ash flows which may affect the surrounding valleys including the new generation of new lahars, SERNAGEOMIN maintains Volcanic Red Alert. 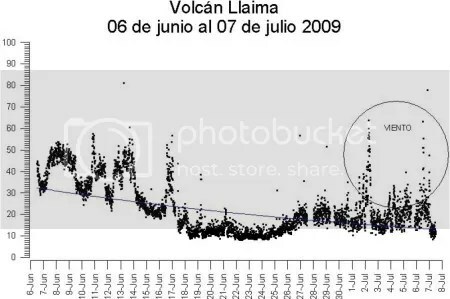 While seismicity at Llaima volcano tended to decrease in the early days of August, it has subsequently increased, slightly exceeding its usual values in this latest period (17-21 August). These oscillations in seismic activity (LP-type earthquakes [Long Period earthquakes] of high and low frequency) could be related to the rising and falling of the magma column located in the principal conduit of the volcano, demonstrating the instability of the magma column. The absence of other types of seismic activity in this type of phenomenon suggests the existence of an unobstructed volcanic conduit, in which magmatic fluids can suddenly rise freely, bringing about a new eruptive phase. Due to the markedly erratic behaviour which the volcano has shown during recent times, it is not possible to rule out its reactivation. Because of the foregoing, SERNAGEOMIN continues with Green Alert level 2, maintaining a 4-km radius of exclusion around the principal crater. 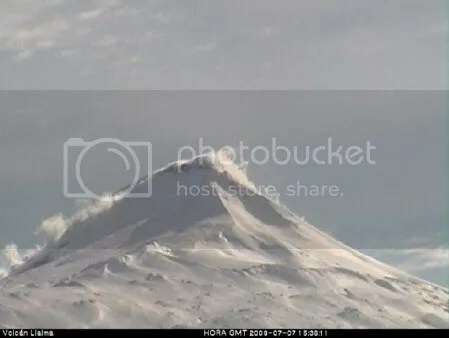 Above: Water vapour emanations produced by atmospheric condensation at Llaima’s summit on 7 July, from the lava flow that descended the western flank in the April eruption and hot areas of the upper part of the eastern flank (image: SERNAGEOMIN). The most recent SERNAGEOMIN bulletin on Llaima (7 July 2009 – click here for PDF) reports a continuing decline in the volcano’s activity since the most recent eruptive period between April and June this year. 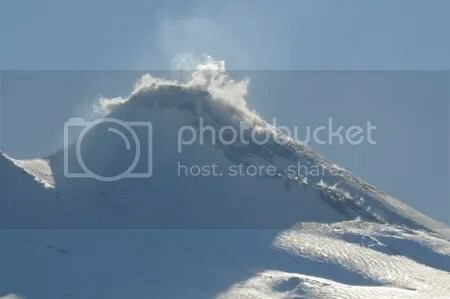 Steam has been visible around the summit and from areas where lava flows descended the flanks in April (visible in the picture above), caused by atmospheric condensation rather than by volcanic activity. SERNAGEOMIN also reports a decline in seismicity, with the number and energy of long-period earthquakes falling since June. 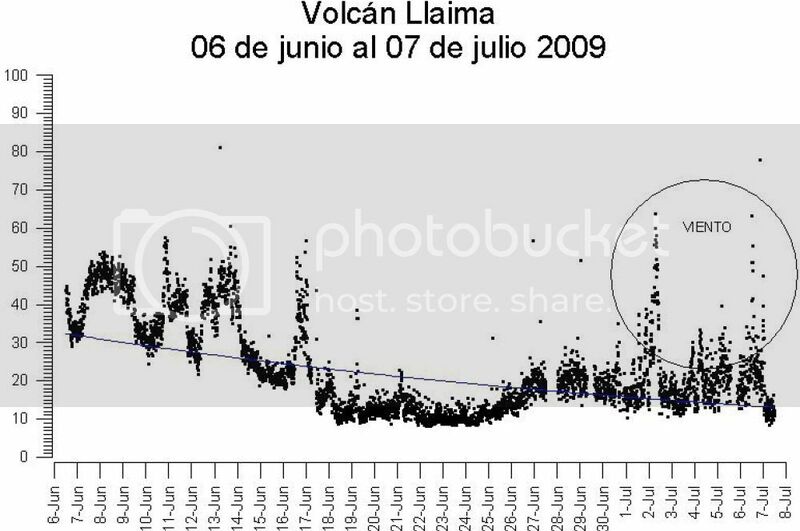 Above: Graph of seismic energy released between 6 June and 7 July, measured by the LAVE seismic station at Llaima. The high points on the right were produced by windy weather (SERNAGEOMIN). Given the low levels of activity at Llaima over the last few weeks, SERNAGEOMIN has lowered the alert level from Yellow (Amarillo) to Green Level 2 (Verde Nivel 2), but warns that the danger of a reactivation of eruptive activity remains. 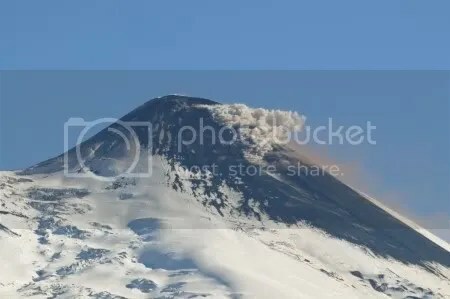 A 4 kilometre radius exclusion zone has been imposed around the Llaima’s summit and SERNAGEOMIN are monitoring the volcano on a permanent basis. The Chilean state emergencies office ONEMI have also issued a bulletin announcing that although the Yellow Alert has been lifted restrictions affecting access to the Conguillio National Park remain in place, and that recreational facilities within the park near Llaima’s summit will remain closed. 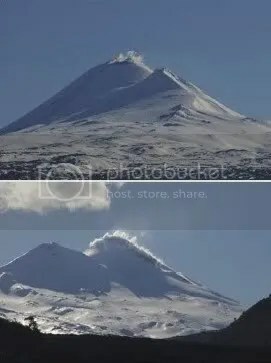 From POVI (Proyecto Observación Visual Volcán Llaima) in Chile comes the following information and pictures of Llaima’s current activity. The current cycle of strombolian activity at Llaima, which began in May 2007, is continuing. 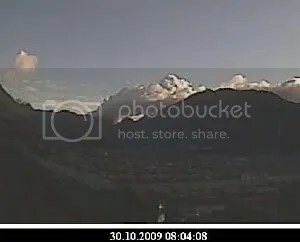 On 26 May 2009, after a period of unusually heavy rain, a 500-metre long fissure on the upper east flank of the volcano began to emit dense clouds of water vapour. On the following day, 27 May, small amounts of ash were observed mixed in with the water vapour, and on 28 May the vigour of the emissions and the ash content increased. The photograph below of the east flank, taken by Victor Hazeldine, shows the fissure and its emissions on 28 May. On 1 June, after further bad weather, the energy of the intermittent emissions along the fissure increased. A powerful phreatic eruption began at 11:20 (local time) on 1 June. The eruption ceased by 12:00, and during that afternoon only one small subsequent eruption was observed. In the early mornings the POVI surveillance camera at Melipeuco shows small, weak glowing points on the volcano, one on the western inner crater, and another sporadic point in the upper segment of the radial fissure. 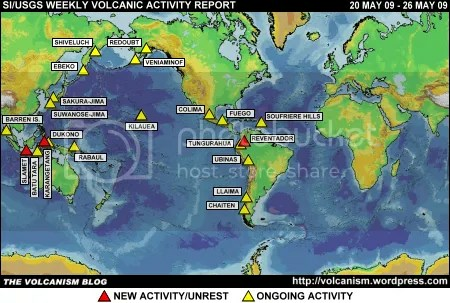 Since the phreatic fissure eruptions began seismicity has remained at normal levels (as measured by POVI instruments 20 km from the volcano) but the number and energy of LP (long period) earthquakes has increased. The picture above, taken by Victor Hazeldine on 1 June, shows a rare close-up view of the phreatic activity at the fissure. The photograph was taken from a position south-south-east of the volcano, 12 km distant, and clearly shows the 500 m radial fissure on the upper east flank. During the night a small lava flow, divided into two parts, was visible at the top of the fissure.